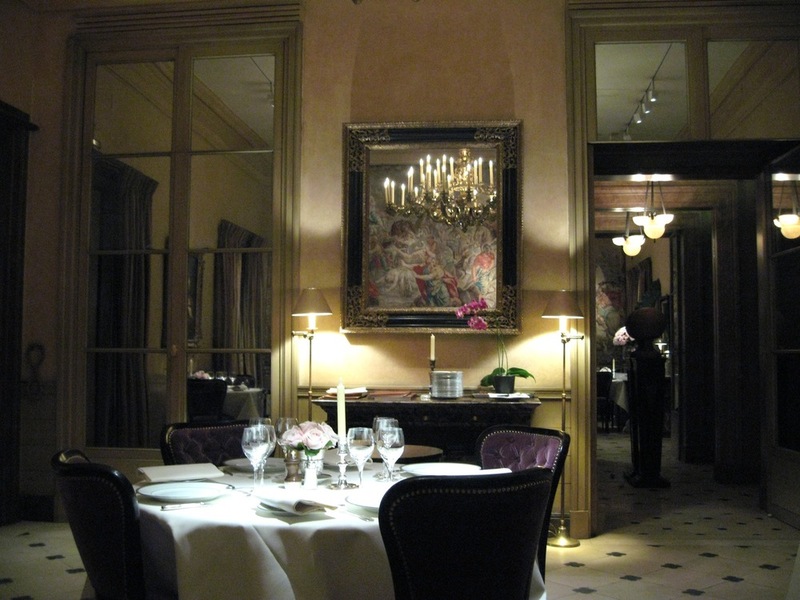 The first time I arrived at L'Ambroisie I was told that I wouldn't be eating there that night. Apparently, the maître d'hôtel had called earlier that day to confirm my table. There were no missed calls on my phone, nor any messages. I was disappointed, to say the least. 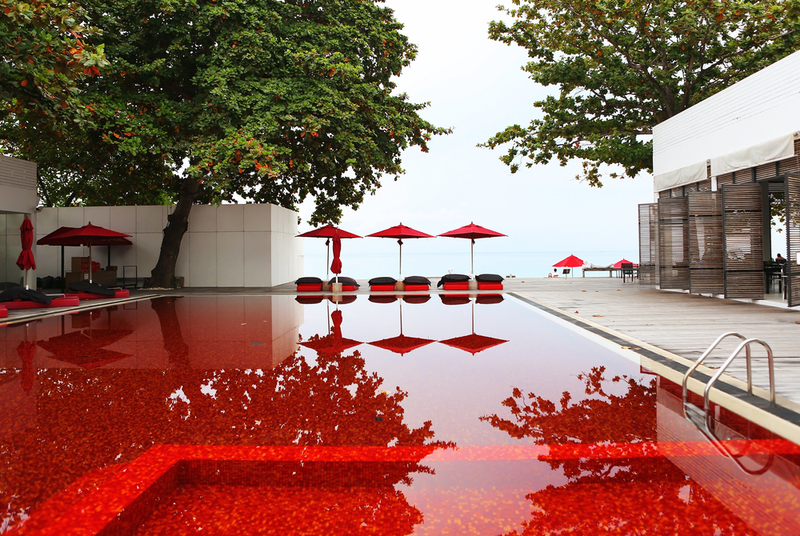 But I made a reservation to return at the next available date, nearly two months later. Certainly, there was a slightly sullen taste in my mouth from being turned away the first time; but this flavor was quickly reversed when I finally had the chance to sample what I believe are some of the most well-executed dishes I've ever experienced. As I walked into the dining room, I was immediately turned off by its apparent chill that came from the cold tile flooring and vaulted ceilings. But as I sat down and probed the space around me, things began to warm up. I realized that unlike Les Ambassadeurs, this was not necessarily cold so much as it was understated. There were no gold ornaments nor heavy crystals to this space. In fact, in this room there were only five tables, which kept the feeling intimate. Only on my way out did I see that there was indeed a second dining room. A more ornate space with parquet floors and a grand chandelier, it seemed to be the more impressive of the two; but was not nearly so cozy. 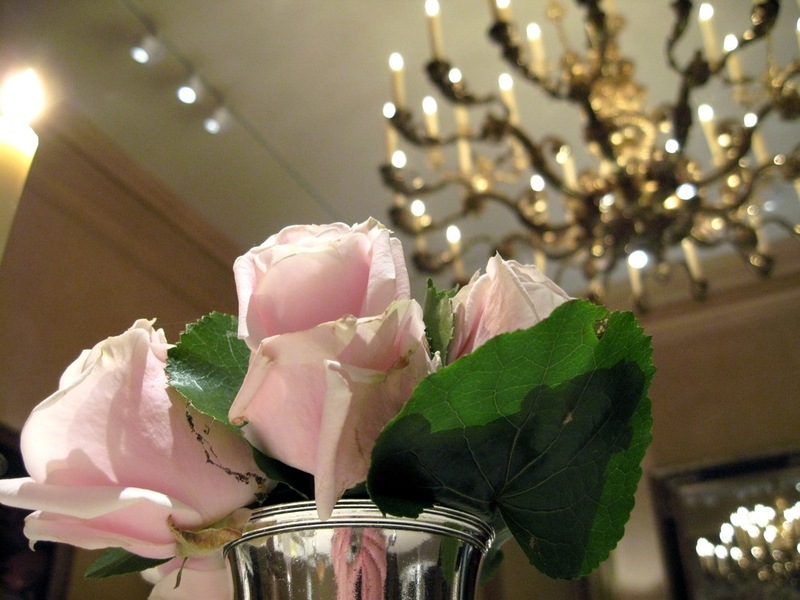 The decorative elements on my table, a simple pink rose and white candle, maintained a level of elegance while keeping a strong focus on the food and the other person. The meal started with my waiter holding a plate full of gougères in front of me until I took one, while the remaining plate of two were placed on the table. This subtle coercion, a testament to the pastry's time sensitivity, worked; otherwise, I would have been sure to take a picture first. And what a nice treat this was: relatively hollow on the inside with a thin layer of warm fragrant crust, not at all oily; but rich with the warm flavor of cheese. 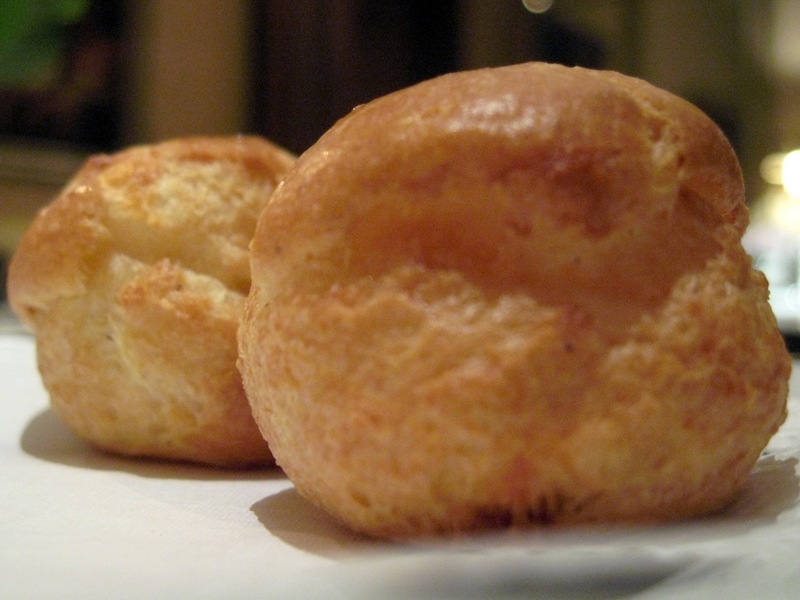 I was reminded that gougères do not have to be a dull requirement of haute French cuisine; rather, when as impressive as the ones I'd just tasted, they can really jump start one's palate, setting a savory foundation to be contrasted with a sweet glass of champagne. I curiously awaited the next step. 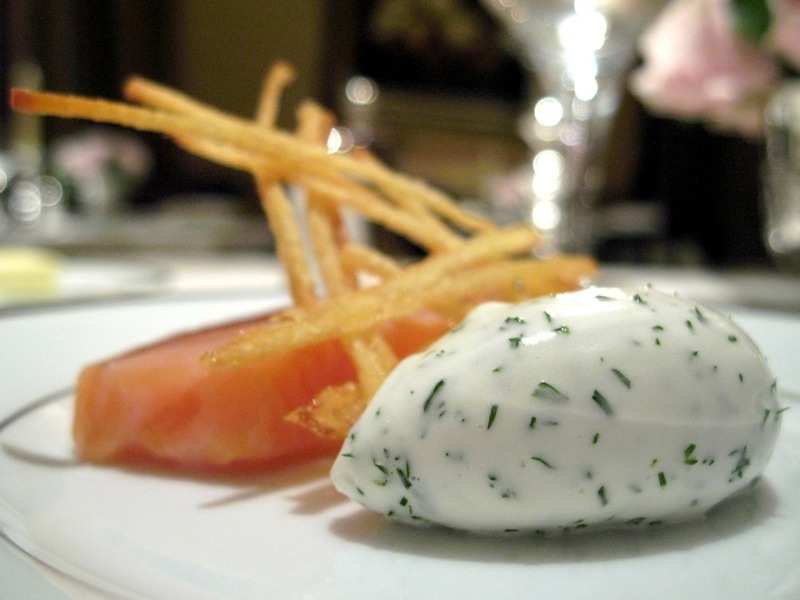 Next came the amuse bouche, very lightly smoked salmon, potato strings, and a dill mousse. Two things struck me immediately about the salmon: the slightest hint of smoke, and its buttery texture. The salmon was so lightly smoked that the woodiness added a subtle hint of complexity rather than dominating the fish's inherent flavor, something I feared after my initial disappointment when this dish was set before me. Nothing to be disappointed about here, though. The texture was lean and supple, so much so that it seemed to melt into the plate. Although the dill mousse was lighter, the flavor of this dish became redundant after a few bites. For me, this was too reminiscent of bagels and lox (you can take the boy out of New York, but...), without a significant enough difference to warrant serving it. The strips of crispy potato did help to break up the textural monotony; but the dish was overwhelmed by the one dimensional flavor of the cold and sour cream. Things turned around significantly in the next course, a velouté de topinambours et noix de saint-jacques, émulsion de truffe. Oh god, how things turned around. Sitting in a velouté of Jerusalem artichokes were three round scallops topped with black truffle. 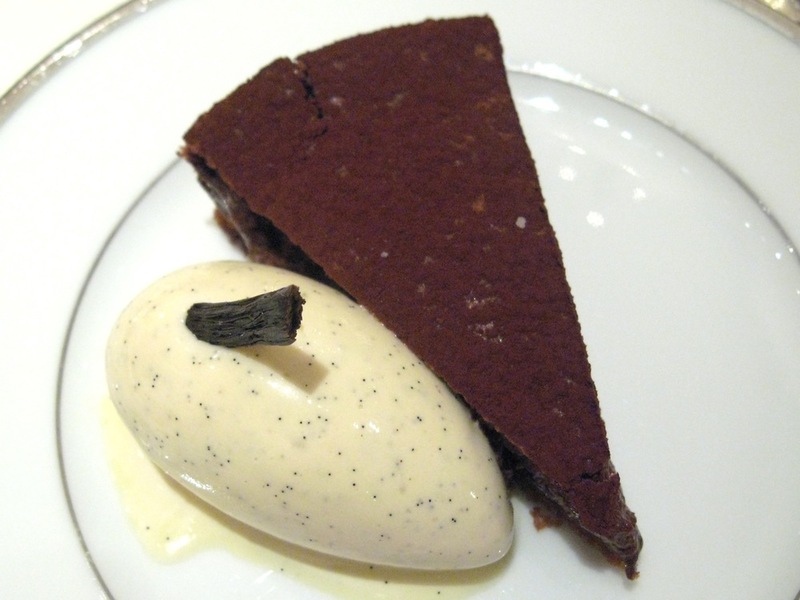 There was no tableside truffle shaving here, a sure sign of L'Ambroisie's confidence. But while there was no truffle show, the fragrance of these heat-activated thin black sheets was outstanding. My first bite revealed the complexity of this dish. The velouté was left grainy, a reminder that artichokes were involved. But more importantly, this texture was a nice transition to the softness of the scallop, supporting its smoothness rather than contrasting against it. As I dipped my spoon into the thick velouté, I noted how it took several seconds for it to fill the void. With these Jerusalem artichokes and scallops displaying such an impressive marriage of earth and sea, frankly I wondered why chef Guy Savoy's soupe d'artichaut à la truffe noire gets so much attention. This was much stronger. Nearly all of my senses were immersed in this dish. Did it really have to end? Next up was not only the highlight of the night; but also a course I am unlikely to ever forget: feuilleté de truffe fraîche "bel humeur." As the waiter approached me carrying what seemed like rather large but simple pastry, I began to second guess my ordering decision. 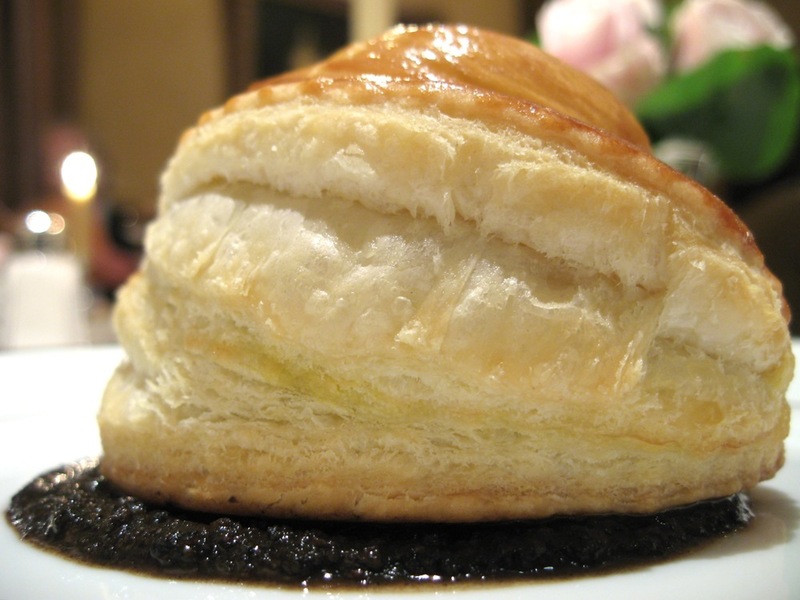 It was humbly placed in front of me, a golden brown puff pastry on a bed of puréed truffle. The dominant smell was of moist bread, a scent similar to walking by a bakery in the early morning. But what made this scent different was a gentle hint of truffle: I knew it was there; but it smelled as if it was hidden. And it was. I picked up my knife, and sliced the pastry in half to uncover a hidden treasure. With the first slice, a puff of steam was released revealing the hidden scent: so that's where the fragrance of truffle was escaping from. The smell was so pleasantly strong and intense, for a brief moment, the entire dining room smelled of my dish. Perhaps that's why this dish is titled "beautiful mood;" I certainly was in one. As I parted the now split pastry, I shook my head in astonishment. Was this for real? 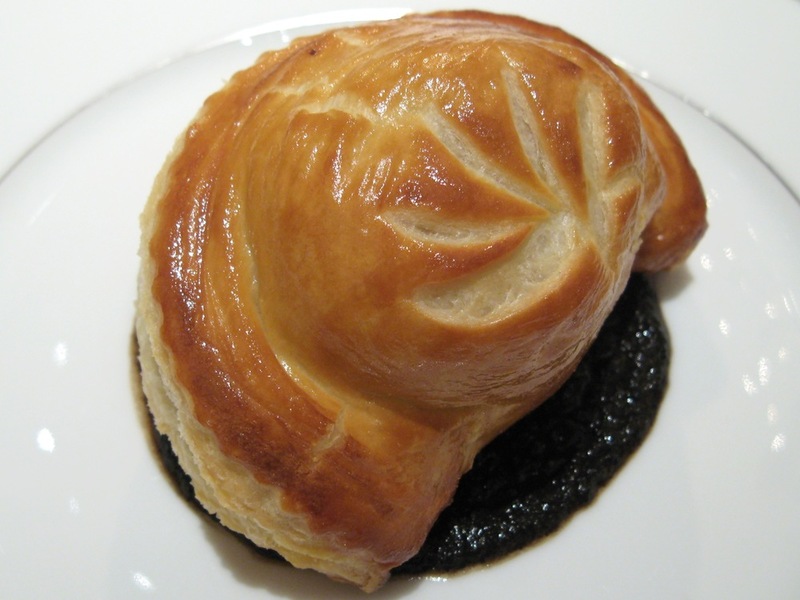 Inside this pastry were two layers of black truffle, each as thick as a generous hamburger patty. I'd never seen truffle in this quantity before. I laughed out loud. Separating these layers of truffle was a layer of creamy foie gras, adding a meaty component to this earthy dish. I could not wait any longer, and took the first bite. What immediately struck me was how I was able to actually feel the texture of the truffle. 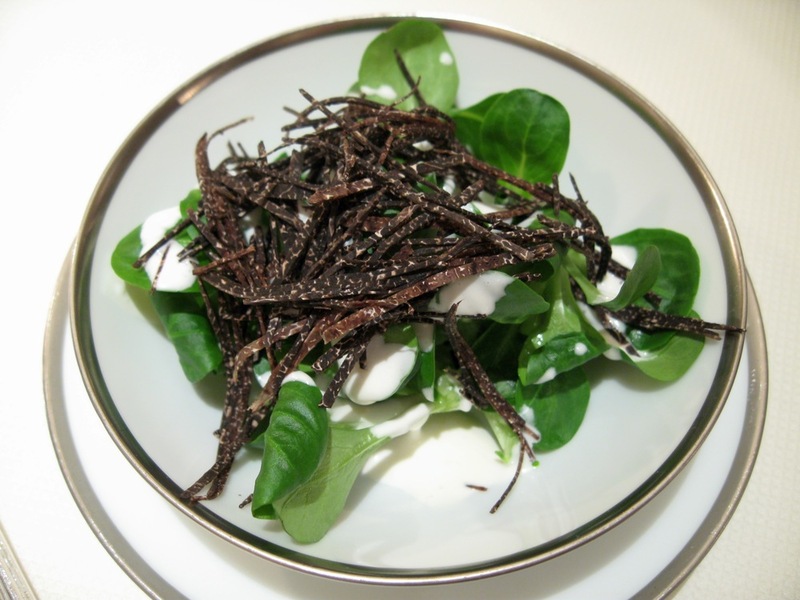 When truffle is shaved, its contributions are in the form of scent and flavor. Here, on the other hand, a third component was added: texture. I was shocked to feel this firm but surprisingly delicate ingredient fracture in my mouth with each bite. 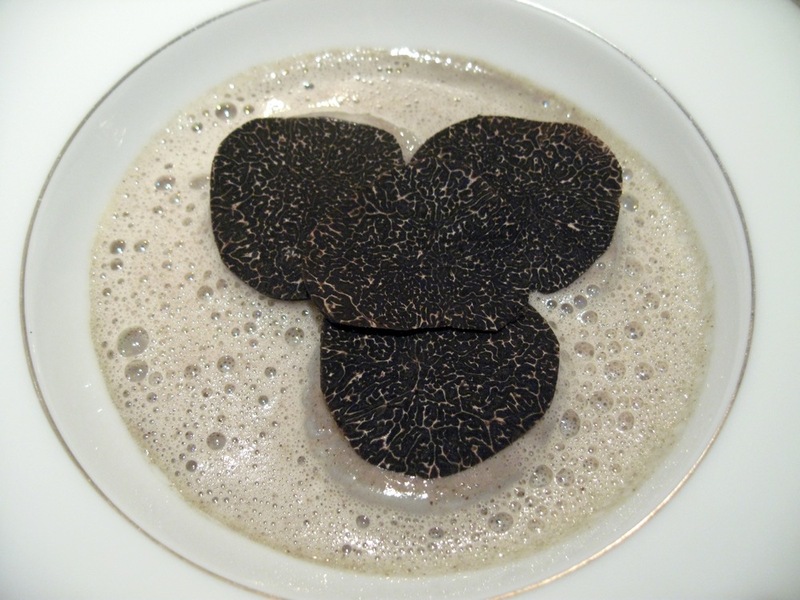 The truffle maintained its dryness, a necessity to enjoy its natural texture. The dish's moisture was balanced by the creamy liver and the truffle purée beneath, the excess of which was absorbed by the light pastry. What a fantastic dish. It was only after finishing this that I noticed a small mâche salad to my right topped with a light crème à la thousand island dressing. Hello there. Was that more black truffle on top? Frankly at this point, if it wasn't so thick as a Pierre Hermé macaron, I wasn't interested. I think the salad was more of an afterthought, or perhaps a social scapegoat to justify having eaten at least something green during this long culinary adventure. Nevertheless, I finished it. It should be noted that this was some wonderfully fresh mâche; something I would have eaten on its own without truffles or dressing. Though, the pleasure from this course was vastly skewed toward the truffle pastry, the sheer audacity of serving a truffle in this quantity left me in awe, and in a position where I will likely remember this course every subsequent time I see a truffle. I took a brief trip to the bathroom, glanced in the mirror and smiled to reveal my black teeth. I had officially become a truffle vampire. I spent a lot of time thinking about this dish. Pretty much nonstop for the next week. While it was certainly the ingredients that made this dish special, it also seemed to be technically flawless. The wonderfully moist pastry could have stood up on its own, and I would certainly wait in line to have one as hot and fresh as this. 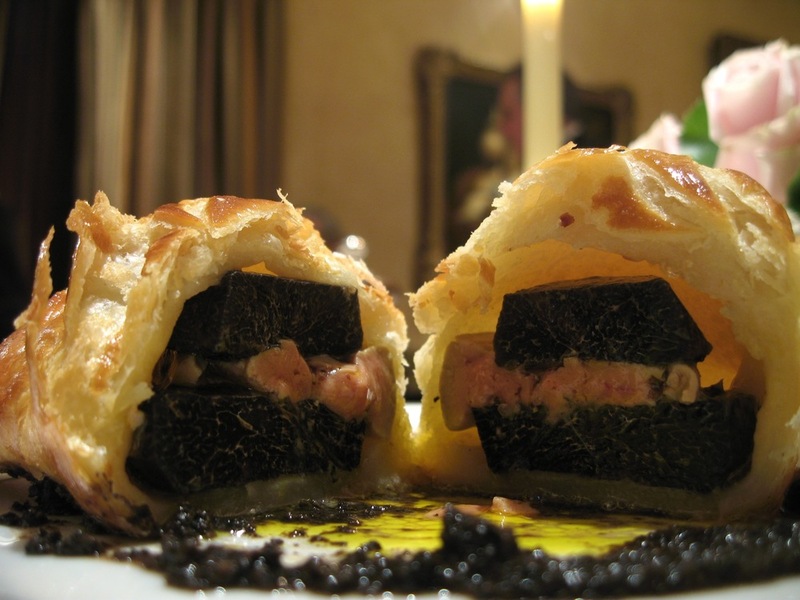 It also seems difficult to me to have baked two ingredients of completely different texture: truffle and foie gras, together in a single pocket of pastry without sacrificing one of the ingredient's textures for the other. Somehow, they both just came out as if cooked independently. Even the truffle purée was a nice addition to the mixture, seeping into the soft pastry and adding an earthy salt. As I finished up this course, I noticed the table next to mine just cutting into theirs. I first heard the chuckle of astonishment, which was quickly followed by the scent of black truffle. For another moment in time, the dining room belonged to them. 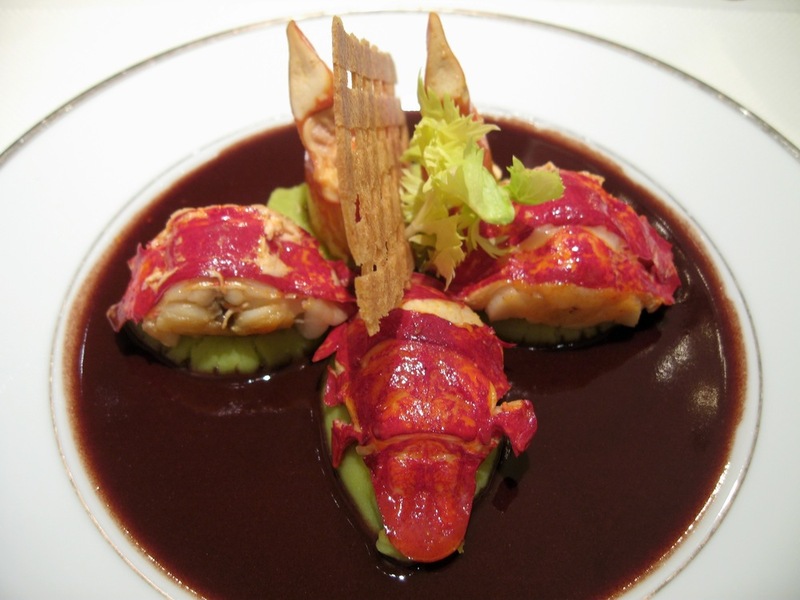 Following this pinnacle was another wonderful course, a fricassée de homard sauce civet, purée Saint-Germain, a large lobster tail served over a bed of gently smashed Saint-Germain peas. The sweet red wine with the salty pea purée was a combination I'd not experienced before, but would certainly be a welcome dinner guest anytime in the future. Delicious. My only complaint was that the lobster seemed slightly overcooked, with a texture that would have been even more inviting to absorb the red wine reduction had it been slightly softer. This could, however, be due to the type of lobster: bretagne blue. The purée made for a nice bridge between the lobster and reduction, soaking up the sauce while clenching tightly to the lobster. The three of these together made for quite a few nice bites. Finishing the savories, a scoop of pear ice cream was served before dessert. The graininess of the pair was obfuscated by the creamy texture of the glace, teasing my mouth with the flavor of pear; but never quite tasting it. I would have liked something stronger. This was disappointing and I expected something either more creative, or with a purer flavor. 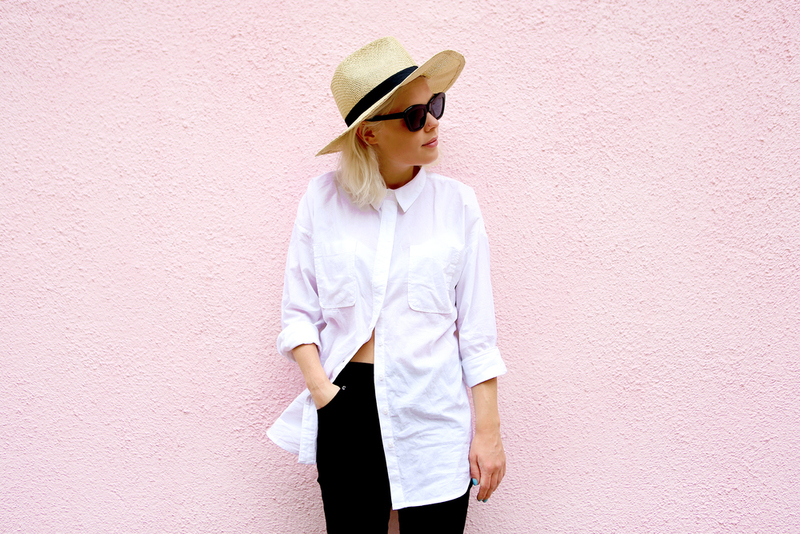 This was also texturally dull as there was nothing to break up the monotony of the cold crème. For dessert, there were quite a few appealing choices. And since I had done my exercise for the day by walking to the restaurant, I chose all of them. I was slightly surprised, and perhaps a little embarrassed, that all the desserts were brought out at the same time. There was hardly any room on the table! But more importantly, it made me concerned about time sensitivity of the dishes. I triaged the plates, and started with the most critical: ananas "victoria" rôti, crème glacée au lait de noix de coco, a cluster of pineapple sided with ice cream, mango vanilla reduction, almond tuiles, and garnished with a few raisins and a peppermint leaf. This was an appreciated appetizer for the dessert tasting. 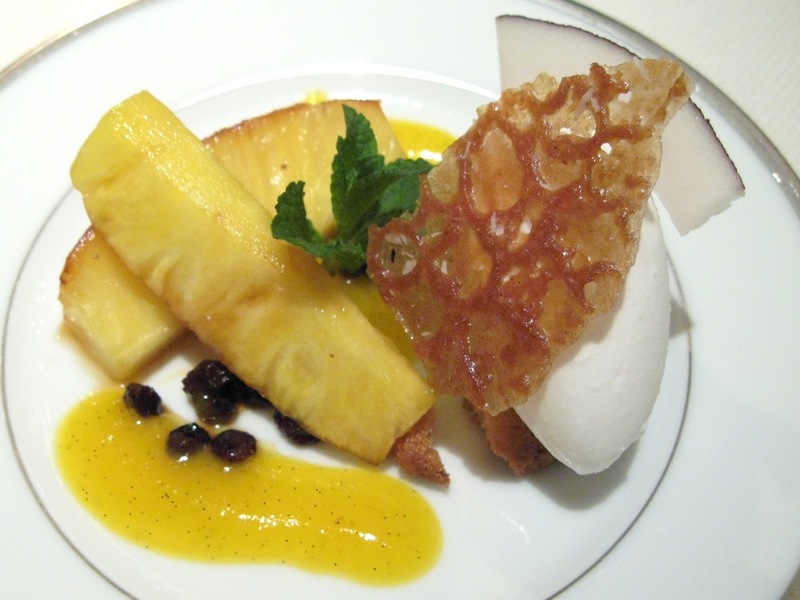 Nothing exquisite, just a light dessert with bright tropical flavors. Next was undoubtedly the highlight of the dessert course, tarte fine sablée au chocolat, glace à la vanille, an ultra-light chocolate tarte with a scoop of vanilla ice cream. This was, without a question, the lightest slice of chocolate cake I've ever had. It had the airiness of a souflée without any runny or creamy textures on the interior. But while it was light, it was still substantive and was not overwhelmed by the vanilla ice cream. 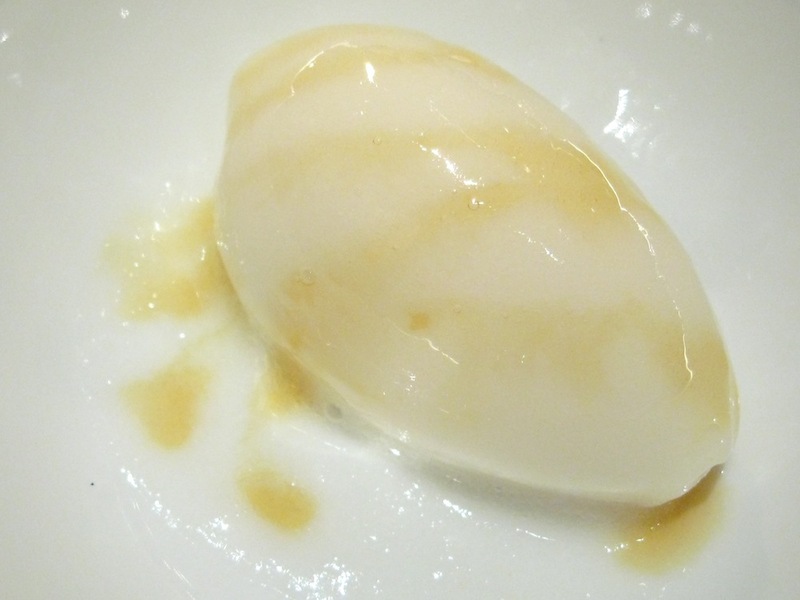 The flavor bordered on bitter, taking much of its sweetness from the vanilla glace. This was fantastic. The final dessert was a little less memorable, palet de chocolat lacté aux marrons glacés, sauce moka. 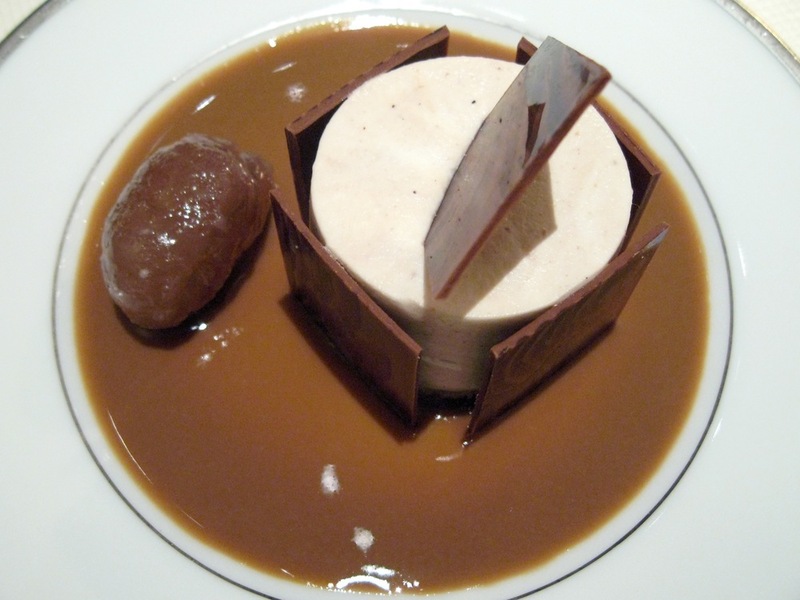 A chocolate mousse surrounded with dark chocolate squares, with a mocha sauce and a candied chestnut. I was reminded of how much I dislike candied chestnuts; their dry pastiness gets redundant and boring after the first bite. Although they appeared to be flawless, these chestnuts were unfortunately no different. With the mocha sauce, the coffee flavor was so light that it did not bother me. In fact, the flavor of chocolate was at the same level of intensity, allowing the coffee, chocolate, and crème flavors to meld together nicely. I found the dish texturally boring and the whole chocolate exterior somewhat annoying -- it always takes extra time to chew chocolate at a cold temperature, and it so it always lingers unnecessarily long in the mouth. I probably wouldn't order this dish again. Last was a small plate of mignardises: almond tuiles, granny smith macarons, cannellé, pieces of chocolate with hazelnut, and wedge-sized apple tartes. Of the collection, the tuiles stood out as fantastic: a fragile web of pastry and almond. The flavor of the tuiles had an essence of nearly-burnt caramel adding another element of complexity. I also really enjoyed the macarons; despite not having a traditional ganache center, the tartness of the apple confiture was pleasing. The cannellés were kind of dense, almost like gelatin; I didn't enjoy them that much. The chocolate at this point was superfluous and seemed kind of taxing on my palate: half of one was more than enough. Lastly, the wedge-sized apple tartes could have used a tiny sprinkle of fleur de sel for balance, I think, as they were very sweet. And just like that, it was over. A special meal with two dishes that stood out so strongly, the velouté de topinambours et noix de saint-jacques and feuilleté de truffe fraîche "bel humeur." I will certainly not forget them anytime soon. I'm glad I was able to return despite some confusion the first time; in my mind, it was certainly worth the trouble. Were I to return only able to order one course, it would undoubtedly be the feuilleté, and that is what I would highly recommend that other visitors here try. I only hope it impacts you so profoundly as it did me.